Enjoy contemporary cottage styling in your bedroom with the Corliss Landing Upholstred Bed. 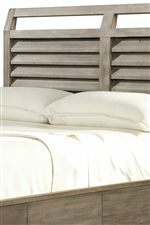 Crafted from responsibly harvested solid Acacia, woodwork features a weathered, driftwood grey finish that brings a rustic look and feel to your master retreat. An upholstered headboard will soften your room and create an inviting experience. 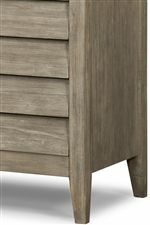 It also features a low profile footboard that brings the piece a casual, relaxed ambiance. This bed is available in Full, Queen, King, and California King sizes. The Corliss Landing King Upholstered Low Profile Bed by Cresent Fine Furniture at Williams & Kay in the Anchorage, Mat-Su Valley, Eagle River, Alaska area. Product availability may vary. Contact us for the most current availability on this product. 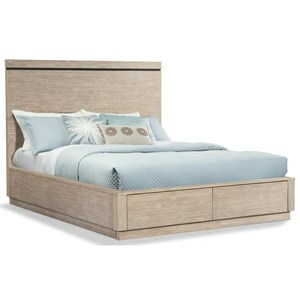 5633KR King Rails & Slat Kit 1 76.5" 87.3125"
5633KB King Upholstered Bed HB/FB 1 53"
The Corliss Landing collection is a great option if you are looking for Contemporary furniture in the Anchorage, Mat-Su Valley, Eagle River, Alaska area. Browse other items in the Corliss Landing collection from Williams & Kay in the Anchorage, Mat-Su Valley, Eagle River, Alaska area.